Nearly three months after an SUV struck and killed a seven-month-old girl who was being pushed in a stroller in the middle of a Point Loma crosswalk, city officials say they are developing plans to ensure such a tragedy doesn’t happen again. Two city engineers say construction of a traffic signal designed to protect people using the crosswalk where the fatality occurred near the intersection of Catalina Boulevard and Cañon Street could begin in two months. Pedestrians would be able to stop traffic 50 feet in front of the crosswalk by pushing a button, which would cause the light to turn yellow, then red, allowing cars to stop in good time, said Kharman Tawfiq, an assistant civil engineer in the city’s Traffic Engineering Division, at the monthly meeting of the Peninsula Community Planning Board May 21. The signal is part of a set of short-term measures the city wants to do right away while a permanent solution is developed, said Phil Rust, associate traffic engineer. There would be three traffic lights in all: one on each side of Cañon Street, plus an overhead light mounted on a mast arm. The existing crosswalk would be replaced with a continental or “zebra”-style crosswalk. It’s the city’s new standard and is said to be more visible. North of Wilcox Street, the two northbound lanes on Catalina Boulevard would split. Only the left lane would continue north. The other would convert to a right-turn only lane. A portion of the lane would be taken out of use and marked with stripping (see graphic). Reaction was mixed. Most board and audience members said they were pleased to see progress toward a solution. But several noted the plan did nothing to slow cars leaving Naval Base Point Loma and other vehicles going north on Catalina Boulevard. On March 2 at around 6:25 a.m., an SUV going north on Catalina Boulevard turned northeast onto Cañon Street and collided with a father pushing a stroller through the crosswalk. The baby, Juniper Aavang, died the next day. The father suffered severe head injuries. “We’re surprised it hasn’t happened sooner. It’s a very dangerous crosswalk,” said Karen George, a resident south of the crosswalk. George said the permanent solution would require better management of traffic leaving the navy base, where commuters suddenly have two lanes available as soon as they exit the base’s northern gate and get on Catalina Boulevard. She said her husband, Vince, has written letters to base commander Capt. Howard Warner and has yet to receive a response. “Catalina is a drag race. We’ve got to slow it down,” she said. Board member Nicole Burgess suggested eliminating one lane from Catalina Boulevard as it leaves the base and adding a bike lane. “There’s really no need for two lanes,” she said. Some board members didn’t like the “eyesore,” as planner Robert Goldyn put it, that would be created by painting diagonal stripes and eliminating a small portion of the right lane on Catalina Boulevard south of the Cañon Street street light. Tawfiq said the city engineers would return next month to present alternatives. Several audience members showed up in support of a plan to close off and convert the block that contains the intersection into a mini-park in honor of the infant. Marisa Smith, the girl’s aunt and long-time resident, asked the San Diego City Council to consider the plan at their March 10 meeting and posted it on change.org. The plan now has more than 1,500 supporters. “We are asking the City of San Diego to end Cañon Street at Talbot Street, and to effectively close Cañon Street from Talbot Street to Catalina Boulevard. In order to accommodate the local residents, there will be an entrance and exit to Southernwood Way with a light at Catalina Boulevard, making the intersection usable by residents only. 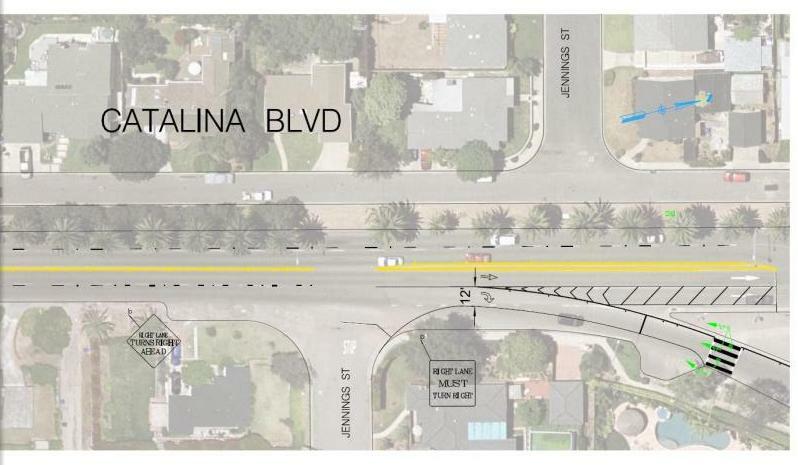 This will eliminate all traffic speeding North on Catalina Boulevard from ever turning West (Right) onto Cañon Street and into Point Loma residential neighborhoods. Rust said he is aware of the plan and it will be taken into consideration when designing the permanent solution. “It would be wonderful if they could turn it into a park,” said resident Michelle Reynolds outside the meeting room after the discussion, with cameras rolling from three local television stations. The City has developed a plan for improving pedestrian crossings at the intersection of Catalina Boulevard and Canon Street. The short-term plan includes the installation of a traffic signal for the right turn bypass lane, re-striping the crosswalk within the bypass lane, and more clearly directing right turning traffic into its own lane. The installation of the new traffic signal is designed to increase visibility and improve safety for pedestrians crossing that part of the intersection. 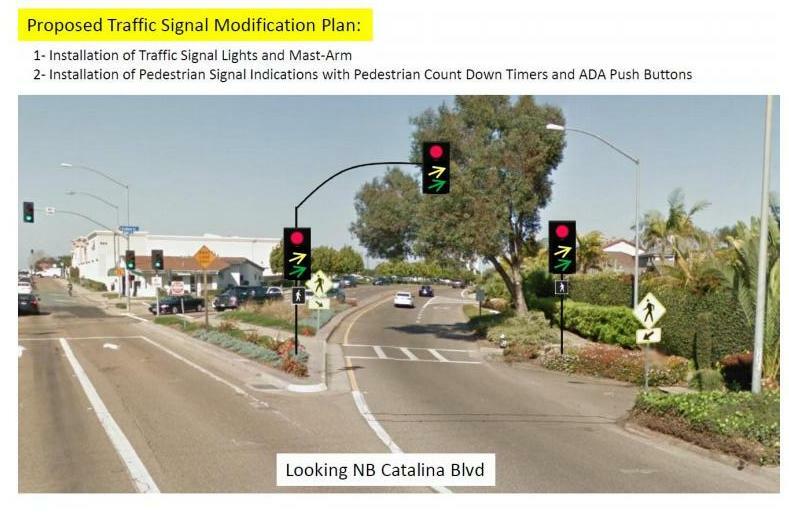 The crosswalk improvement will include the installation of a standard traffic signal with green, yellow, and red overhead lights easily seen by vehicles travelling northbound on Catalina Boulevard. The signal will extend out from the island above the crosswalk and will be equipped with additional pole mounted traffic lights to ensure visibility from a safe distance. The light will remain green until the signal is activated by a pedestrian wishing to cross the intersection. The distance from the limit line where vehicles need to stop to the crosswalk itself will be about 50 feet. In addition, northbound Catalina Boulevard will be reduced to one lane. The right lane on northbound Catalina Boulevard will become a right-turn-only lane to Canon Street instead of accommodating through and turning traffic, as it does today. Additional signage will be installed along Catalina Boulevard to alert drivers that the right lane will eventually become a right-turn only lane. The City will begin working on the installation of the improvements as soon as possible and is committed to completing the project within the next two months. A specific, long-term solution for this intersection has not yet been identified. The City will be working directly with the community for input to develop a long-term plan for the area. As a plan is developed, funding will be identified. That whole street (Catalina) is dangerous, at least form the unmanned gate heading North to Cannon. I drive there to work and back and aside from this tragedy, I’ve seen over the past 6 years several cyclists get hit, mostly by impatient Naval personnel in a hurry to get home from work. Older Article: What’s Next for the “New” San Diego Union-Tribune?